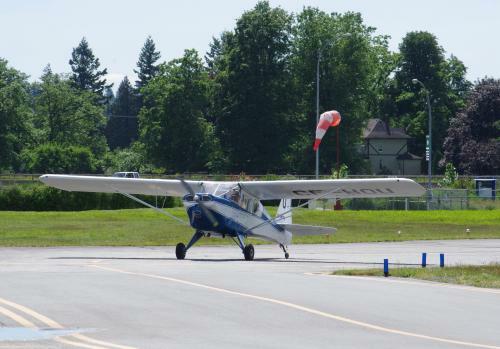 The beginnings of the Fleet Model 80 Canuck go back to 1939, when J. Omer (Bob) Noury, an air engineer with the Ottawa Flying Club, decided to design and build a light aircraft for the Canadian market. The aircraft was a high-wing monoplane of conventional structure using a welded steel-tube fuselage and tail surfaces, and powered with a 65-horsepower Continental flat four-cylinder engine. The Noury T-65 Series 1 design was first flown on January 21, 1940. 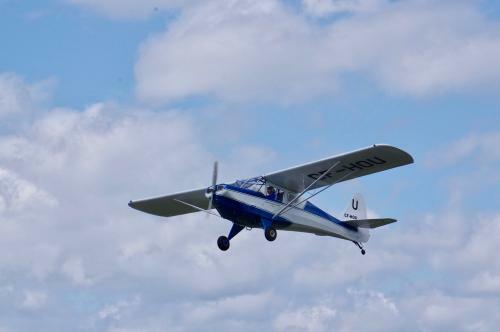 The aircraft was given a certificate of airworthiness and Noury sold it in 1941. In 1942 he formed Noury Aircraft Ltd. at Stoney Creek, with himself as president and general manager. His intent was to design and build a light aircraft based on his own monoplane design. The Noury N-75 featured side-by-side seating and a 75-horsepower Continental engine. It was test flown from the Hamilton Airport at Mount Hope late in 1944. The Noury was shipped to Fleet's facilities at Fort Erie and test flown by Fleet's test pilot, Tommy Williams, on June 4, 1945. This resulted in modifications to the forward fuselage geometry, lowering the engine four inches to improve the forward visibility, and moving the engine forward four inches to allow the relocation of the fuel tank from the centre section of the wing to the forward fuselage. This made possible the installation of a clear skylight in the cabin roof. The original Continental C-75 engine was replaced by a more powerful Model C-85, and a new fin and rudder were installed. The Canuck was first flown in its modified form on September 26, 1945. Between 1945 and 1948, 198 Canuck aircraft were built by Fleet. 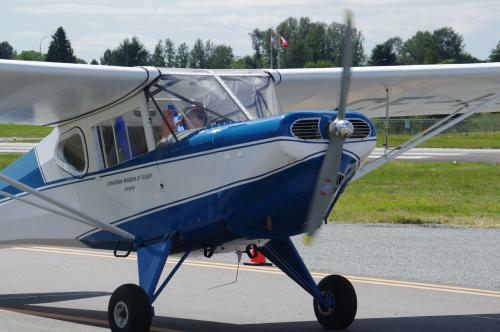 The Canuck proved popular and initially sold well to flying clubs, charter companies, and private owners in Canada. In addition 24 were exported. By late 1947, plagued by postwar financial difficulties and the sales slowdown that affected all aircraft manufacturers, Fleet was forced to terminate production of the Canuck model. The Museum's Canuck was flown in Alberta for about 20 years before joining the Museum in 2003. ...Langley. No doubt about it. The final approach to landing, with the majestic Golden Ears in the background. The colour scheme is the classic 1960s aero club style. The Canuck soars again - the first time since 1999. 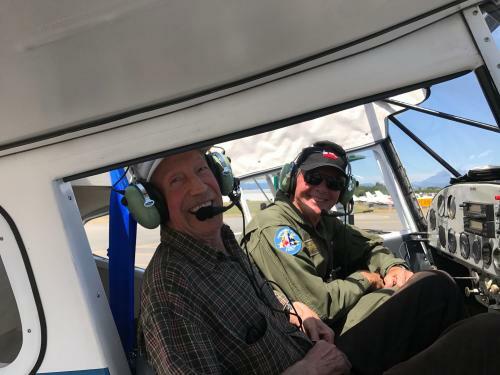 As the Canuck was readied for flight it was re-united with its donor - Hank Koehler. Hank bought the aircraft in poor condition and donated it to the Museum. It has been a long-time restoration effort by Museum volunteers. As recorded earlier, the Canuck is flying again. Now the donor and aircraft have been re-united. As more flight time is accumulated, Museum members will be able to fly in the Canuck and hopefully Hank will be one of the first. The long-awaited milestone of an engine run on the beautifully restored Canuck took place on Tuesday afternoon - 3 November. With a few minor adjustments to make it will soon be ready for the next milestones; logbook certification and the test flight. The Continental engine purrs in the Canuck. Steady progress is being made for the Canuck to return to its element - in the air. Final cockpit fit out is complete with electrical and radio wiring installed, all new upholstery in place, wing fairings fitted and a number of other small details being attended to. One of the major steps for a rebuild is the updating of the Weight and Balance report. This is gone into in great detail in government regulations. To comply with these, the aircraft has all its normal equipment on board, but no fuel. The aircraft is then put into the level attitude while on scales and the reading at each wheel is noted. Calculations are then done to specify the total empty weight of the aircraft and the location of the centre of gravity. These numbers are then compared with the certification data for the aircraft and if all is in order then this test is satisfactory. The information is used before each flight so the pilot can calculate the weight and balance to ensure controllability of the aircraft - having the centre of gravity beyond the certified limits can result in serious controllability issues. The Canuck in the level flight attitude on the scales. Sample calculations from the FAA handbook. The complete aircraft! Ray (right) and some of the volunteers who made a Complete Canuck. Progress! The left wing is installed. So, how much special finish does it take to finish the wings? A small mountain! The finished product gleams after the final coat of white finish. The pace continues with work on the right wing underway! The initial coat of finish has been applied. The fabric has been applied to the lower surface of the wing. The metal surfaces have been coated with Polybrush. The wing had the two coats of white applied, then was masked for the registration letters to be applied. complete coverage. These protect the fabric against UV rays. Recovering of the wings of the Canuck is under way in Ray's workshop. The left wing has had the fabric covering installed, the fabric tightened with a hot iron and the initial layers of Polybrush applied. This is progress! Ray applies one of the three coats of primary finish to the wing. Bill carefully applies one of the initial coats of special finishing material. After the second ironing the fabric covering has been stretched taut over the frame. The synthetic fabric has been applied to the wing and the hot ironing started. Steady progress is being made on the Canuck restoration with the time-consuming interior fit out well under way. The next major project will be for the wings to receive their fabric covering and paint. The wings are fitted to ensure accurate fitting of the windshield and the wing fairings. The windshield is now in place. Electrical and radio fit out is a painstaking (and painful?) job for our avionics technician, Mike. The Canuck is coming together nicely and work has begun rigging the tail section. We'll continue to post photos and updates as they become available. Things are moving along at good pace over at Ray's place. More photos will be posted as they come. The Canuck fuselage is finally home in the CMF hangar! April, 2012 - Masking removed, paint scheme takes shape! The fuselage was taken out of storage and moved to Ray's place for fabric. Once completed it will return to the museum for further assembly. 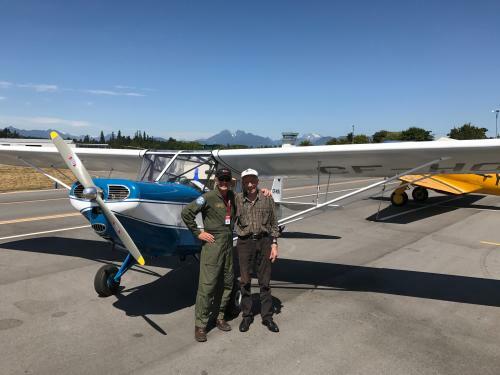 The preliminary activity on the Canuck has been completed with certification of the work by a licenced Aircraft Maintenance Engineer. The components are now in storage awaiting the start of fabric covering of the wings and fuselage later this year. The wings have been trial fitted to ensure the alignment of all components. If you are wondering why you can see through the Canuck's skeleton, it is because of the typical construction methods of the 1940s. The fuselage is steel tube with wooden battens used for shaping, the whole lot then being covered with cotton. These days we use a modern, long-lasting synthetic fabric covering. The wings are aluminum alloy structure also covered with fabric. Many coats of special finish are applied to make the covering aerodynamically smooth and long lasting. The wings have been trial-fitted to the fuselage - a sound procedure that confirms all components are in alignment before fabric covering is started. The final structural work on the wings is well under way with skinning of the leading edges with aluminum sheet almost completed. Flight controls and their control cables, as well as navigation lights and wing struts have been prepared for final assembly. In addition, preparation is well under way for the permanent mating of the wings to the fuselage with the installation of the landing gear. Although our fine old lady may feel a little embarrassed by being rudely hoisted, engine-less into the air for the fitting of her wheels, she will soon feel comfortable in her new set of fine fabric clothing. The final work on the wings is under way. Back on her wheels again! Wing structural components in final assembly. Wing structure ready for assembly. Fuselage prepared for covering with fabric.